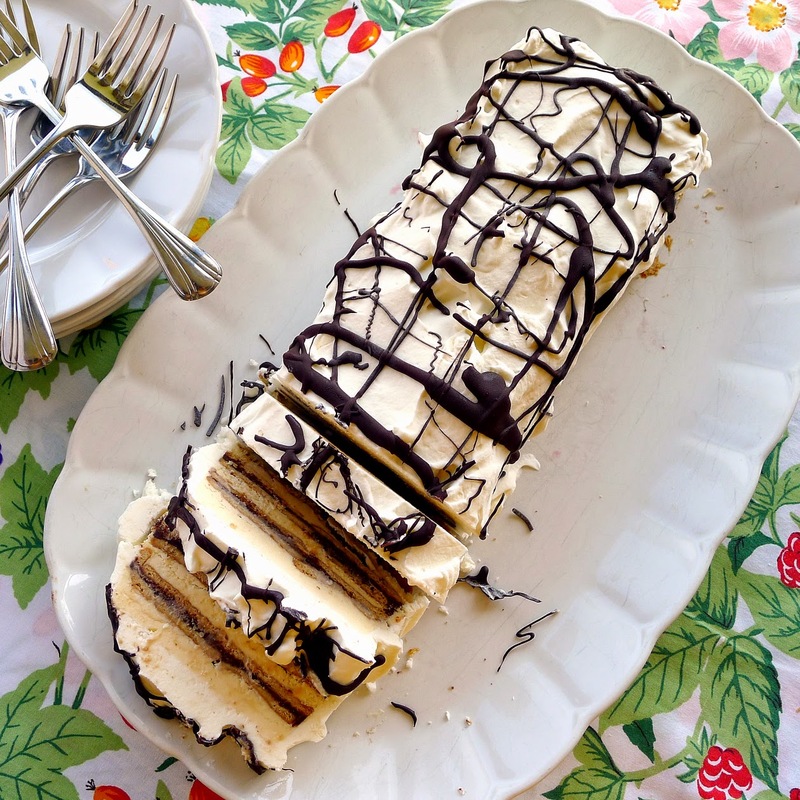 Perfect summer dessert--frozen torte with whipped cream and squiggles of chocolate. 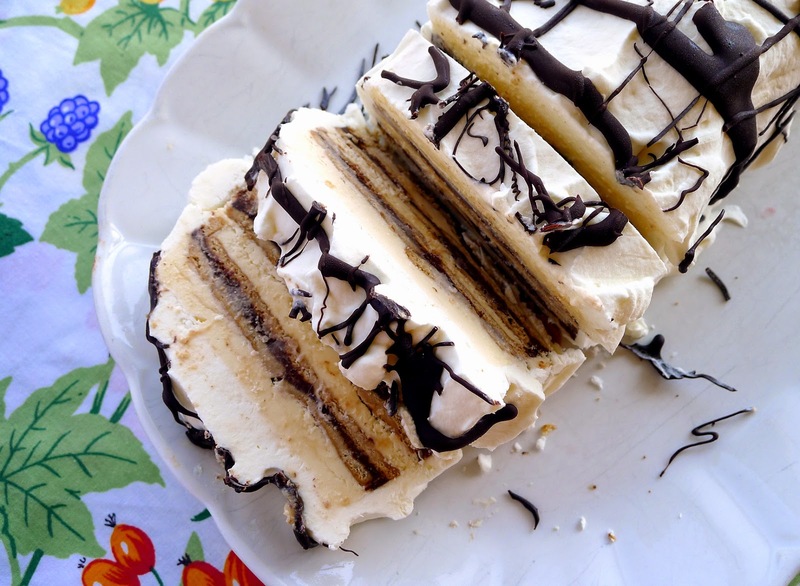 I remember my mother making “ice-box cake,” put together with layers of vanilla wafers and pudding. Yeah, ice-box. Back in the late 40’s, in the Midwest town where I grew up, the ice man delivered chunks of ice that cooled the insulated box for storing milk, butter, meat. 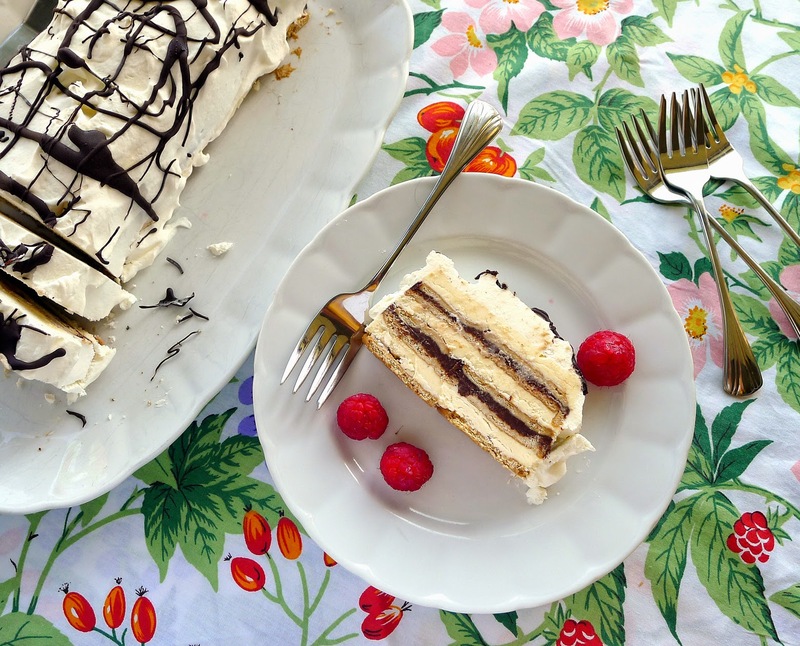 Spain has its version of this summertime dessert, tarta helada, or frozen torte. Here it’s put in the freezer, not the fridge. It comes out much like an ice cream cake. Retro, sure, but a really good idea for a hot weather dessert to serve to guests when I certainly am not going to turn on the oven. Nope, not even for pie, something else I remember fondly from Midwestern summers. Tarta helada has lots of variations. Add a layer of chopped fruit, such as peaches or dried figs that have been soaked in brandy. Add a spoonful of coffee to the milk for a mocha flavor. Substitute sweet Sherry or a liqueur for the brandy or, if serving to children, omit the alcoholic flavor completely. Sprinkle toasted almonds or hazelnuts on top. Because it's so rich and sweet, this torte makes enough to serve a crowd. Prepare it days ahead of a party and have it ready in the freezer. Add it to last week's menu for summer dining. Cookies for layering the cake. I used rectangular galletas tostadas, a type of plain, not-too-sweet cookie. 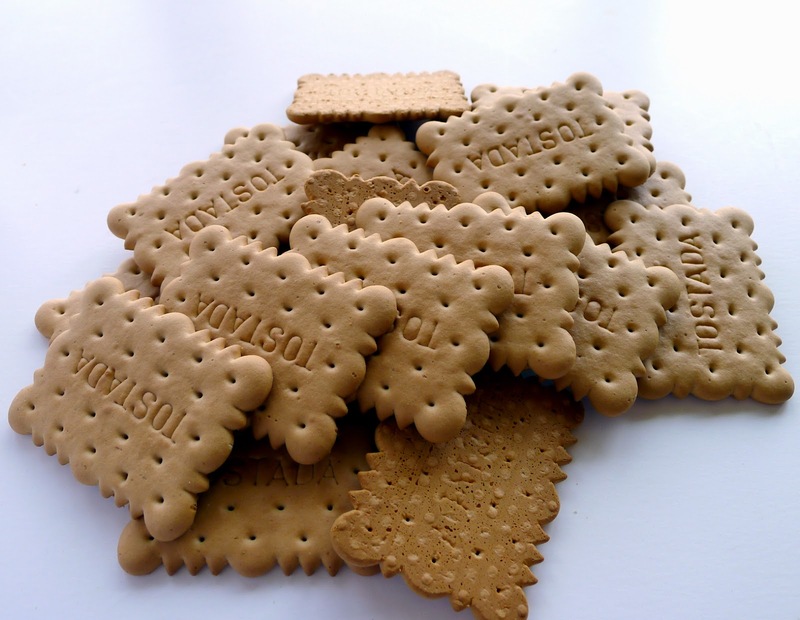 Each cookie measures 2 ¼ inch X 1 ½ inch. I needed about 45 cookies, about 9 ounces, to fill a 11 ½ X 4-inch loaf pan. 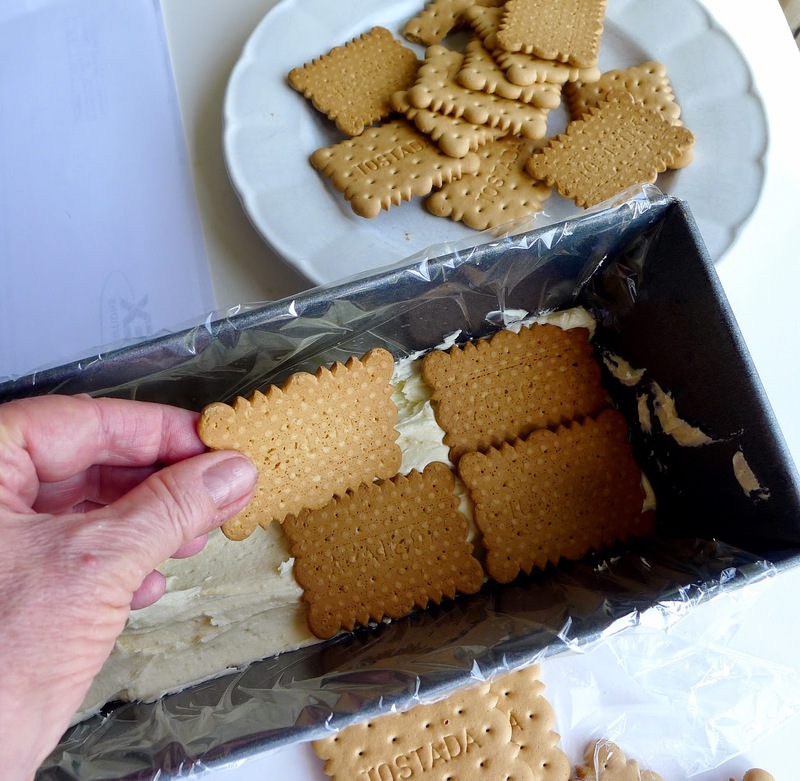 To substitute graham crackers, use 1 packet, or about 11 sheets. It’s fine to break them up to fit the pan. Don’t soak the cookies in milk—just quickly dip them, in and out. Otherwise they turn totally soggy before you get them placed. I found the buttercream filling to be so sweet that I didn’t want more sugar added to the whipped cream frosting. I suggest you taste as you go. This recipe calls for raw egg yolks—if that is a health problem in your area, just omit them. Freeze the cake days before, then slice and serve. Cream the butter in a mixer at medium speed. Beat in the confectioners’ sugar, little by little. Beat in the egg yolks, vanilla and pinch of salt. Set aside. Put the cream in a small pan and bring to a boil. Add the chopped chocolate. Remove from heat and allow the chocolate to soften for 5 minutes. Stir the chocolate until it is completely smooth. Set aside. Prepare a loaf pan (approximately 11 ½ X 4 inches). Oil it lightly. Line it with a sheet of plastic film. Spread a layer of the buttercream mixture in the bottom of the loaf pan. Place cookies on a layer of buttercream. Combine the milk and brandy in a shallow bowl. Dip cookies, one by one, into the milk-brandy and place them in a single layer onto the buttercream. Spread ½ of the chocolate on top of the cookies. Add another layer of cookies dipped in milk, then buttercream. Continue with cookies, chocolate, cookies, buttercream and finish with cookies. (Five layers of cookies.) Fold the plastic wrap over the top and place the mold in the freezer for at least 8 hours. Prepare the frosting. Chill the beaters and bowl before whipping the cream. Whip the cream until it holds soft peaks. Beat in the sugar and vanilla. 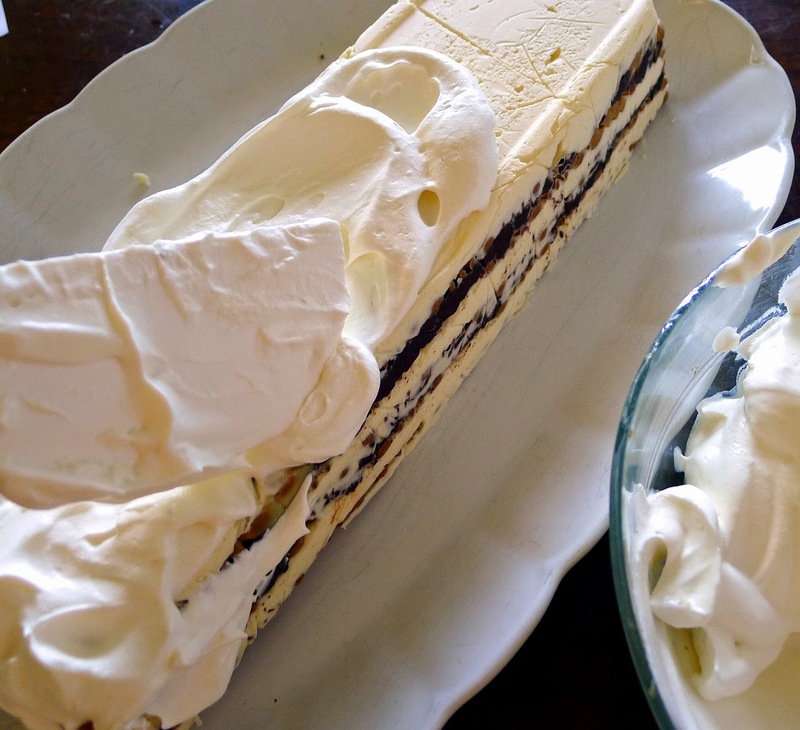 Slather the torte with whipped cream. Remove the torte from the freezer. Let it set about 4 minutes. Loosen edges with a knife and unmold the torte onto a platter that will fit into the freezer. Remove the plastic wrap. Working quickly so the torte doesn’t melt, frost the torte with the whipped cream. Return it to the freezer for 1 hour. Prepare the chocolate glaze. Combine the chopped chocolate and oil in a small saucepan. Heat gently until chocolate is melted. Remove from heat and beat the chocolate until smooth and glossy. Again remove the torte from the freezer. Drizzle the chocolate over the frosting. Return to the freezer. When the frosting and glaze are frozen, remove the torte from the freezer and wrap it in plastic wrap and foil. Store it in the freezer until serving time. To serve, dip a sharp knife in hot water and cut the torte into slices. 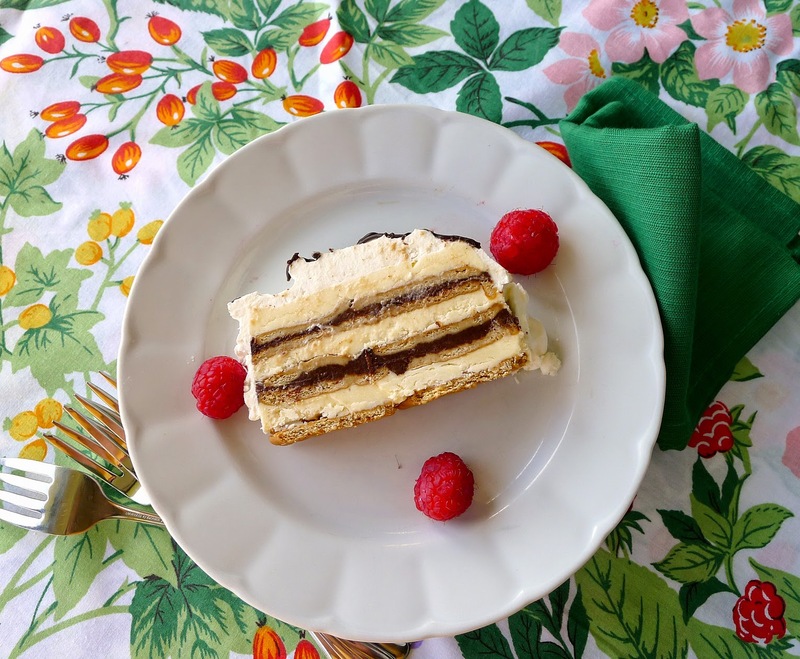 For easy serving, the torte can be pre-cut and individual slices wrapped in plastic wrap and returned to the freezer. wow this cake look super delicious.. and the layers look fab! definitely craving a slice right now. Thalia: And, best of all, no oven needed! It is unusual for me to use butter, however. I adapt most recipes--desserts included--to olive oil.